The two ships were now the de facto spearhead of the Turkish fleet. They could attack mercantile traffic in the Black Sea, and strike Crimea and the Russian coasts by shelling coastal fortifications. A raid of the Turkish fleet against Sevastopol was no longer desirable but could not be foreseen. 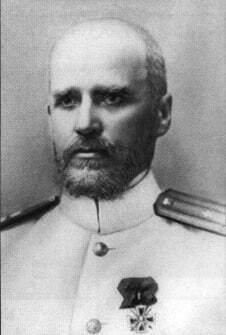 The fleet of the Black Sea was commanded by Vice-Admiral Andrei Augustovich Ebergard (or Eberhardt). It consisted of the pre-dreadnoughts battleships Evstafi, Ioann Zlaloust, Pantelimon (the former Potemkin), Tri Sviatitelia, and Rostislav, and several cruisers. 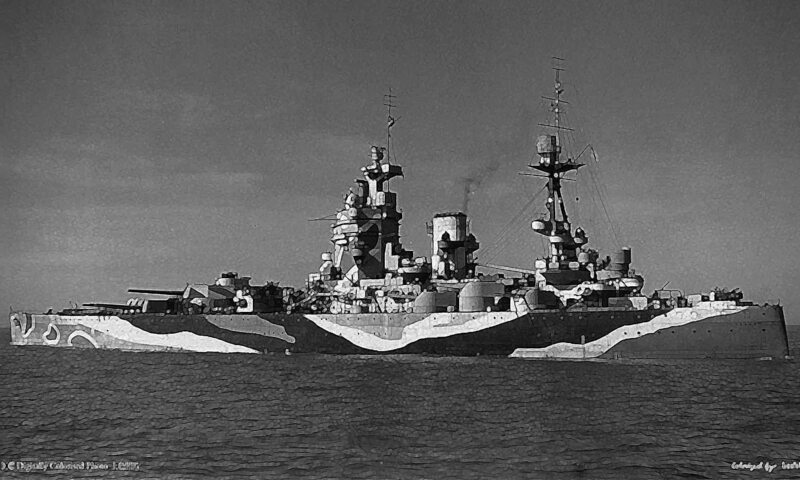 The battleship crews had been trained in the technique of concentrating the firing of several ships on a single one, which had been learned at the expense of the Russo-Japanese War, and which required the use of one of the battleships as is, placed at the center of the line and correcting the shooting of the other ships by radio. On 29 October diplomatic relations between Turkey and Russia were broken off. If the Turkish fleet, now reinforced, was now more threatening, the Russians awaited the completion of three modern dreadnoughts that were to restore the balance (the Imperatritza Mariya). 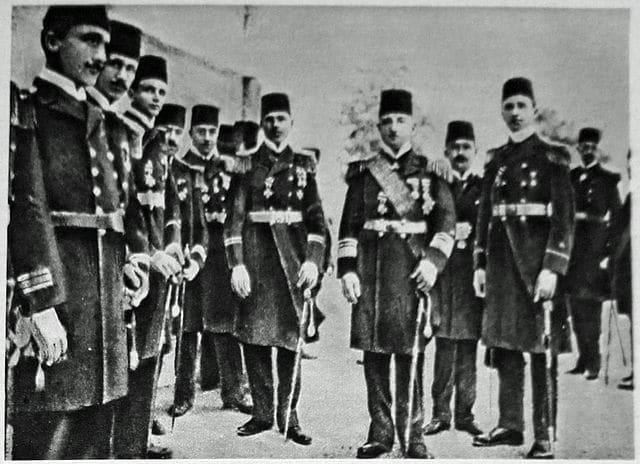 On 15 November Eberhardt gathered his forces at Sebastopol (5 battleships and the cruisers Pamiat Azovia, Almaz and Kagul, as well as 13 destroyers) and tackled to raid the fortifications of Trebizond. He arrived there on the 17th, shelled the coast, and then ascended it to find possible enemy ships at anchor. Failing to find any valuable targets, he changed course for Sevastopol. For his part, Admiral Souchon, who commanded the Goeben, thought that a raid against the Russians would be relatively easy. The latter whom he considered to be undermined by political troubles after the 1905 mutiny and commanded by incompetent officers of best, also featured slow, obsolete ships. Informed by the headquarters of Constantinople of the raid of the Russian fleet, he set sail at 15:30 hoping to intercept him. Souchon traveled up the Anatolian coast and first headed towards Sinope, but received by radio the news of a course change from Eberhardt to Sevastopol. He also headed north, hoping to catch up with his fleet. 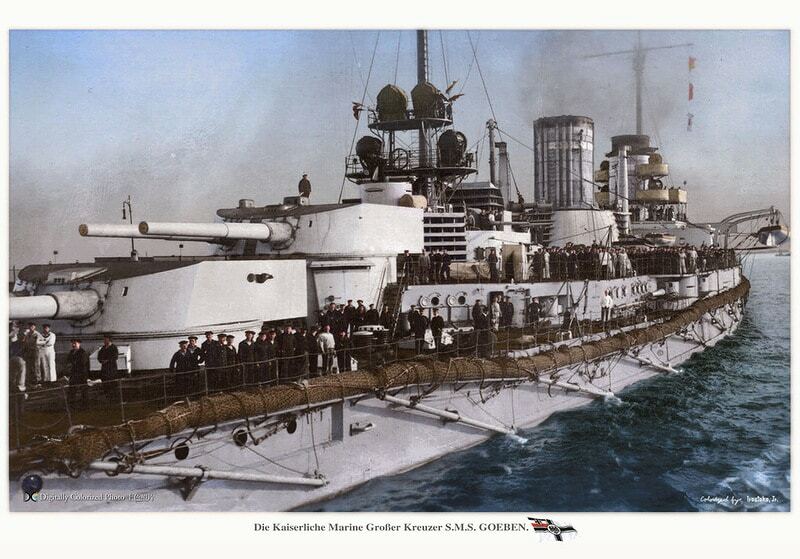 Indeed, the Goeben and Midilli could easily exceed 25 knots. But Souchon believed that the Russian fleet had to sail at the rate of the slowest units, like the Old Tri Sviatitelia, while himself had to stick to 15 knots, sparing the fuel reserves. On the morning of the 18th, Souchon was in sight of the Crimea, by a very dense fog. He sent the Midilli as a scout, while himself hit at 18 knots. On his side the Russian Admiral had divided his forces as follows: He placed his three cruisers in a vanguard, in one line (Pamiat Azova, Almaz and Kagul) and then followed himself 6.4 km behind, with a battle line on board battleship Evstafi, followed by Ioann Zlatoust, Pantelimon, Tri Sviatitelia and Rostislav. 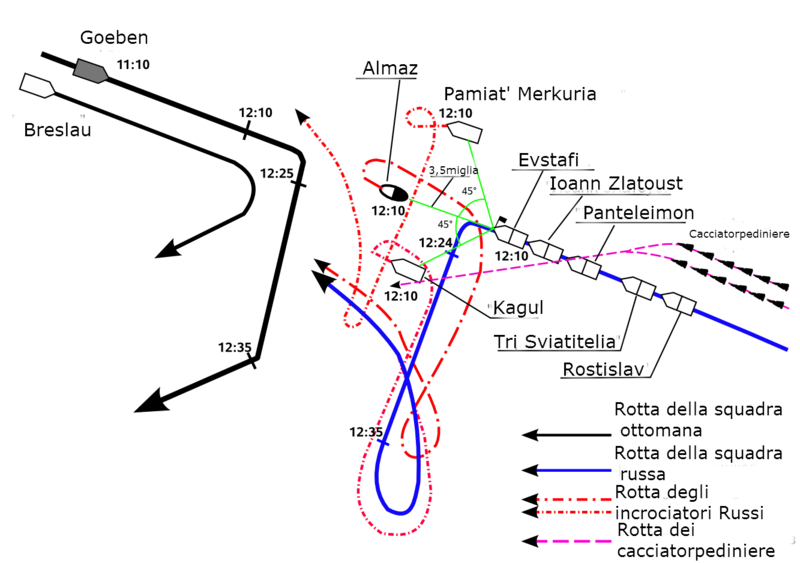 The latter two were slow, and when the Admiral ordered the speed to rise to 14 knots, only widening the gap that existed between the ships initially (457 meters). The line of battleship itself was followed and framed by two lines of destroyers. Around 12:10, the Midilli and the Almaz saw at the same time. The two units flipped over to get back to the bulk of their fleet. The Russian cruisers then departed from the bulk of the forces and the Goeben headed east-southeast to face the Russian line. The two lines came in frontally. 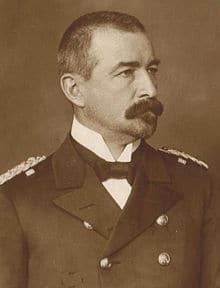 But if the tension and enthusiasm were palpable on board the Goeben, Admiral Eberhardt was very anxious on his side: The enemy’s line ship was still not visible. On paper, the Evstafi and the two battleships that followed immediately had 12 pieces of 305 mm of an old model against the latest Krupp batterie of ten 280 mm of the Goeben, less powerful but more accurate, faster to the point of being able to deliver almost two volleys for one. 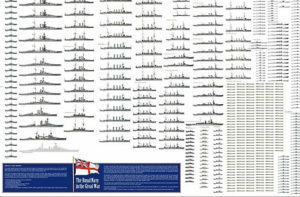 The armor of the Russian battleships had been defined before the Russo-Japanese War and was therefore poorly arranged, while the Goeben had internal armored bulkheads of 220 mm running over all the vital parts of the ship, and although theoretically less protected, Had for him its much superior speed. 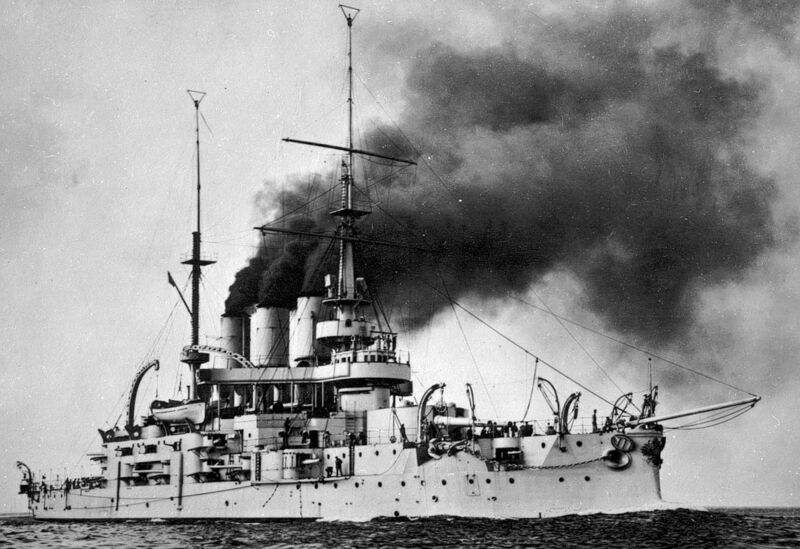 Finally, in the Russian tactics of fire concentration, it was the second battleship, Ioann Zlaloust, which had to correct by radio the firing of the other two. Commander Galanin, oboard the leading battleship, was impatient to see the Admiral ordering the classical maneuver of “closing the T”, ie tacking all his ships in a course perpendicular to that presumed of the enemy in order to present a full broadside all his battleships. The maneuver had to be ordered quickly to have time to be executed by ships not exceeding 15 knots. But Eberhardt hesitated. He did not want to expose his ships while maneuvering. The German battle cruiser indeed could force the pace, arrive from a slightly different route to that planned, taking advantage of both the fog and its speed, bypass The Russian line and fall back on his rear before successively engaging his units starting with the weakest at the tail, whereas the line of fire of his ships were in a blind angle… On board battleship Ioann Zlaloust, the fire control lead ship for the whole line which followed at 450 meters, did not see the change of course of the Evstafi nor the German ship, such dense was the fog. The Goeben, for his part, had spotted the leading ship and in turn tried to “bar the T” by heading south, in order to present all his battery. The distance fal rapidly to 7040 meters, and Eberhardt, to the great relief of his men, decided that he could not wait further and opened fire at approximately 12:20. 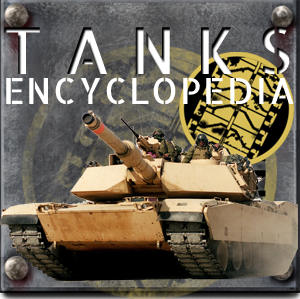 Only his front turret gave voice, for his maneuver to place himself in parallel was not yet completed. When his rear turret entered the dance, he also gave all his secondary battery pieces in view of the distance, letting the Goeben believe that he was gunned down by the whole line of Russian battleships. 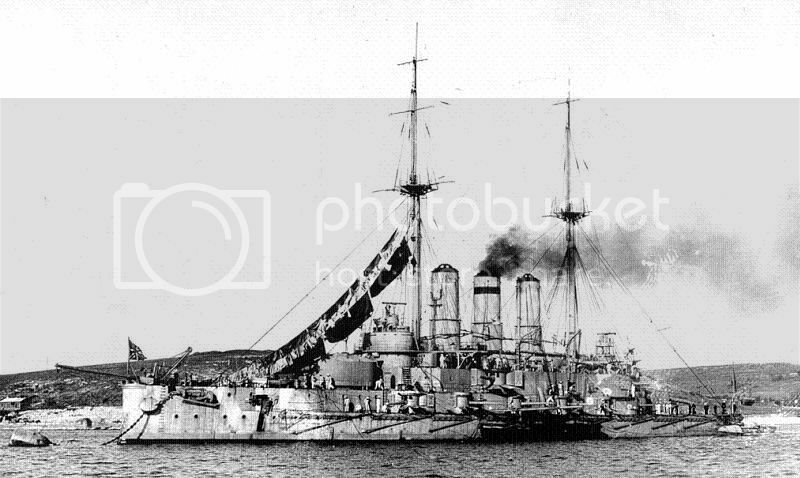 On the side of the second battleship was the Evstafi and its departures of fire, but not the German ship. 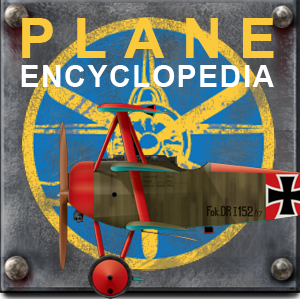 The telemeters gave an erroneous first report, estimating the Goeben at 11,000 meters. He opened the fire followed by the Tri Sviatitelia, whose blows fell, of course, too long, while the Pantelimon gave up temporarily, and that the Rostislav engaged the Midilli whom he could see. 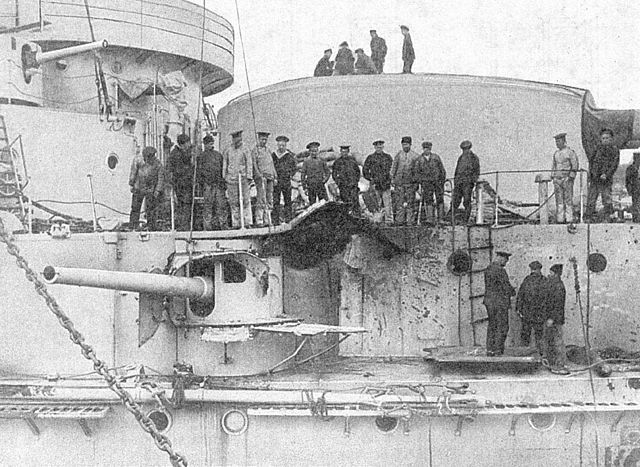 The German and Russian reports diverge on certain points of the battle, but it seems that it was the Russian battleship Evstafi who shot first, with a good aim since the Goeben was touched twice in its freeboard. 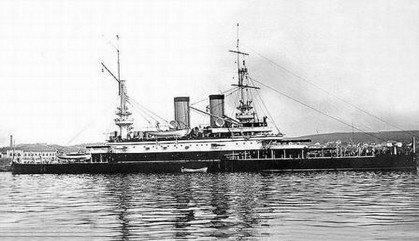 Moreover, the Goeben was slow to adjust its rise because the Russian ships were now advancing parallel to the coast, merging with the fog. But once a shooting solution was found, the first burst fell too long, although a shell smashed the front chimney, thereby simultaneously knocking out the radio sighting station, preventing during all the engagement the command ship to correct the firing of the other units that followed. Her second salvo fell too short, but the next two put two blows to the goal each. The Russian ship, on the other hand, replied with powerful 203 and 150 mm secondary parts, even though the Goeben’s battery contained only 150 mm, which apparently did not come into action. The Goeben, to the stupefaction of Souchon who greatly underestimated the Russians, was struck by some other impacts, not very serious (the German reports are vague). Then distance decreased to 6000 meters and towards 12h35, SMS Goeben disappeared from sight of the Russian battleship in vanguard. She took advantage of the cover of the mist. Although this fact is still debated, it is hard to believe that Goeben intentionally wanted to do battle in the thick of the fog. Her captain was also afraid of the nearby coastal batteries of Sebastopol, for his parallel race with the Russians was now leading him straight on. Still, 10 minutes later, Eberhardt ordered the squadron to head back to the harbour. German reports of the action of Cape Sarytch will attest that only 19 heavy caliber shells were fired during the engagement. The port side casemate had been hit hard by a 305 mm, and one gun was HS, its servants killed instantly. It is possible that the sharpness and density of the Russian fire disconcerted Souchon. It is also true that the range of his ship was not inferior, but he had the sight because of his position in relation to the coast and that the fog was indeed too thick to continue the engagement with success. Actually, and whatever opinion the Germans had at the time of the Russians, a battle cruiser could not face 5 battleships and hope to emerge unscathed… One thinks what would have happened had the weather been fine, which is common in the Black Sea. In the end, the Goeben was doing quite well: If the 150 mm ammunition magazine located under the affected casemate had caught fire, the explosion that followed would have been catastrophic. There were about 16 victims on the German side, 33 dead and 25 wounded on the Russian side. The casemate was quickly repaired, as the Goeben made another sortie on December 6, but its activity became more modest until the end of the war. On the Russian side one could not speak of victory. Eberhardt had to fight against the fog since he had had a unique opportunity to sink the German ship thanks to a clear superiority of fire. Halpern, Paul G. (11 October 2012). 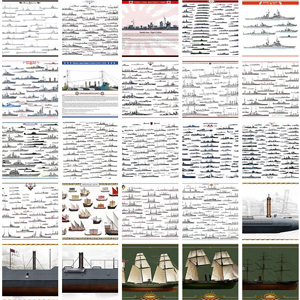 A Naval History of World War I. Naval Institute Press.